Former Sri Lanka captain Hashan Tillakaratne, the high performance batting coach of Sri Lanka Cricket (SLC) and his charming wife Apsari Singhabahu Tillakaratne who heads women’s cricket of the SLC, said the Observer-Mobitel Schoolboy Cricketer of the Year contest has been a source of encouragement and inspiration to young cricketers to progress beyond school level. Former Sri Lanka captain and ex-chairman of selectors Sanath Jayasuriya said the Observer-Mobitel Schoolboy Cricketer of the Year title would take outstanding young players closer to the Sri Lanka ‘cap’.Commending the Sunday Observer for conducting the event for 40 long years, the explosive former Sri Lanka batsman said the mega title he won in 1988 as an emerging player from St. Servatius College, Matara was a great source of encouragement and inspiration. President of the Sri Lanka Schools Cricket Association (SLSCA) , Oshara Panditharathna, who is also the Principal of Dharmapala Vidyalaya, Pannipitiya, said the Observer-Mobitel Schoolboy Cricketer of the Year contest has rendered a yeoman service from the days when there had not been an official inter-school Under-19 cricket tournament. Seven former Sri Lanka cricket captains, who had enjoyed exemplary careers at school level, have commended the exemplary role played by the Observer-Mobitel Schoolboy Cricketer of the Year contest during the past 40 years. They shared the common view that the Mega Show has made a priceless contribution to promote school cricket and recognize milestone achievements of schoolboy cricketers, even at a time there had not been any official inter-school tournaments. MOBITEL COMPLETES 11 YEARS AS MEGA SHOW TURNS 40! School cricket will be at its best with the key matches scheduled to be played during the coming weeks. At the same time, the race for the Observer-Mobitel Most Popular Schoolboy Cricketer of the Year will reach its climax with the commencement of the traditional inter-school ‘Big Matches’ from this weekend. Yet another former Observer Schoolboy Cricketer has made Sri Lanka proud with an explosive half century. When Bangladesh made a commanding 193 for 5 in 20 overs in Thursday’s first T20 International in Dhaka, it appeared to be a daunting task for Sri Lanka.But when Sri Lanka got that dream start they had been looking for, the visitors ultimately found it easy to reach the target with 20 balls to spare for the loss of only four wickets. Three former Observer-Mobitel Schoolboy Cricketer of the Year main award winners during the past decade are making their presence felt with the current Sri Lanka national team. The trio - Dinesh Chandimal (2009), Niroshan Dickwella (2012) and Kusal Mendis (2013), who made it to the Sri Lanka team just months after their crowning glory, have become vital ingredients of the national team, cementing their places in next to no time. The rich 40-year-old history of the Observer-Mobitel Schoolboy Cricketer of the Year contest has given that much-needed inspiration and motivation to the country’s budding schoolboy cricketers to extend their playing careers beyond school level.There have been many outstanding players who aggregate over 1,000 runs or capture over 100 wickets during a season but only a few have taken such performances to the next level. Playing for a reputed club after ending their school careers and winning the Sri Lanka cap thereafter has been the dream of every schoolboy cricketer but only a handful would eventually fulfill that dream. 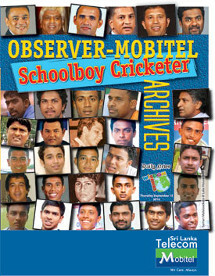 The ‘Observer-Mobitel Schoolboy Cricketer of theYear’ contest, which marks its 40th anniversary this year, has come a long way since its humble beginnings in 1978/79. Ever since the then Royal captain Ranjan Madugalle was adjudged the inaugural Observer Schoolboy Cricketer of the Year at Nawarangahala exactly four decades ago, the contest has produced many legendary cricketers including Sri Lanka’s World Cup winning captain Arjuna Ranatunga and the world’s highest Test wicket taker Muttiah Muralitharn.